The chili powder and cumin coating on these oven roasted sweet potatoes makes them absolutely perfect in burrito bowls, on tacos, or on their own! They’re great with eggs at breakfast, too. I’ve been making these like a crazy lady. I’m talking once a week. I honestly will probably have a hard time making plain roasted sweet potatoes ever again. I make a big batch of these and then reheat them in my toaster oven. It only takes about 5 minutes for them to get super crispy again; it’s like they’re fresh out of the oven. 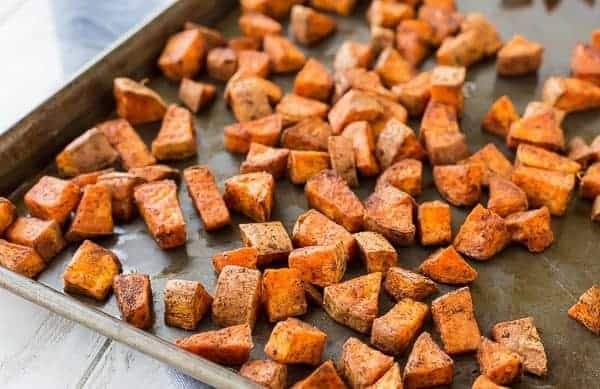 This recipe for oven roasted sweet potatoes was one of my go-to recipes during Whole30 (thank goodness I’m done with that, ha!) but it’s one that carried over into post-Whole30 life. I’ve seen enough turkey burgers and cauliflower rice to last me quite some time, but I just can’t get enough of these roasted sweets. I love, love, love them in a burrito bowl. They add a soft, rich texture to the usual components — rice or cauliflower rice, shredded chicken, greens, tomatoes, avocado. Bonus points for restaurant style salsa. These oven roasted sweet potatoes add such a great layer of flavor and texture. 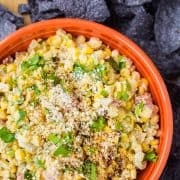 They’re also great with black beans to make a vegetarian taco. Add all the toppings you want and you’ll never miss the meat! I also love them at breakfast. I’ll choose a savory breakfast over a sweet one 99% of the time, so these alongside some eggs and fresh fruit or vegetables is all I really need at breakfast. Well, that and coffee. Coffee goes without saying though, am I right? 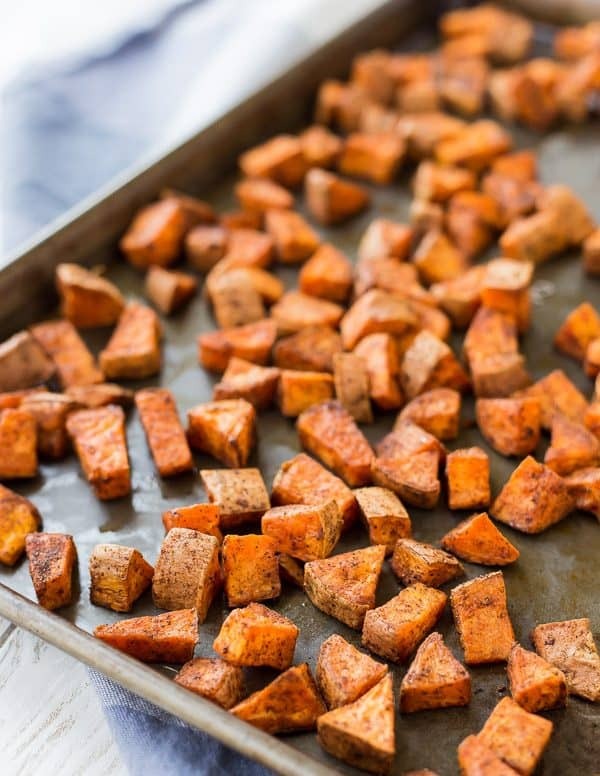 PS: If you love these, try my maple mustard roasted sweet potatoes and shallots or check out my full list of roasted vegetables – there are over 40 recipes listed from simple roasted vegetables, to sheet pan dinners, and even a few things that are roasted but aren’t vegetables! PPS: I also can’t wait to try these melting sweet potatoes – how phenomenal do they look? If you like things hot and spicy, try adding a sprinkle of cayenne powder. A little goes a long way, so try starting with 1/4 teaspoon and working your way up from there. If you want these to be a little smoky, try adding smoked paprika. I’d recommend starting with 1/2 teaspoon. 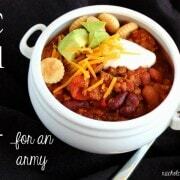 Another way to add a smoky flavor would be to use chipotle chili powder instead of traditional chili powder. If you plan to use them on tacos, you might like to use my homemade taco seasoning (don’t use a store-bought package since it contains thickeners and preservatives). I’d recommend starting with 1 tablespoon. 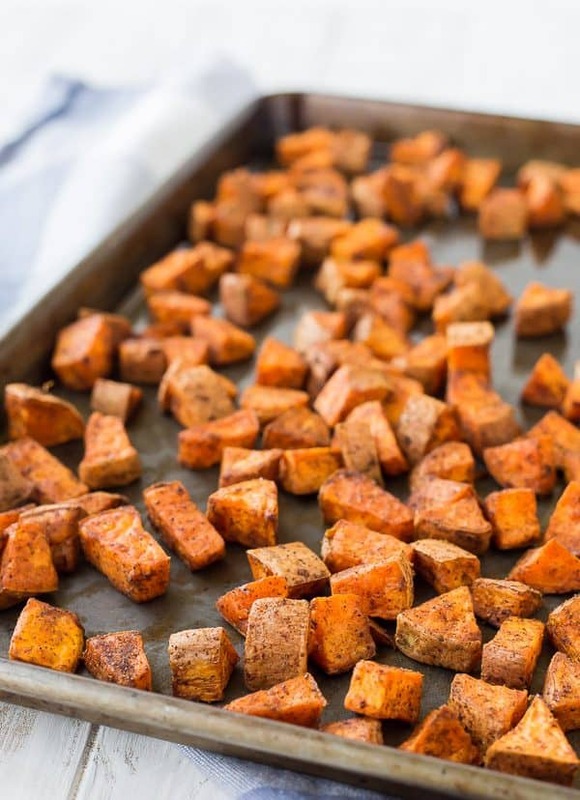 Place sweet potato cubes in a bowl and pour olive oil on the top. Sprinkle with spices and salt. 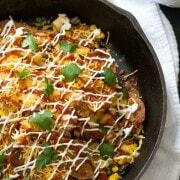 Toss to coat using a spoon or rubber spatula until all potatoes are evenly coated with spices. Spread potatoes into a single layer on the prepared baking sheet. Bake for 20 minutes, stir, and continue to bake for 10-15 minutes or until crisp on outside and tender on inside. Note: You may peel the sweet potatoes if you wish – I prefer to scrub them well with a brush and eat the peelings. Verdict: I probably already covered it, but I LOVE these oven roasted sweet potatoes. 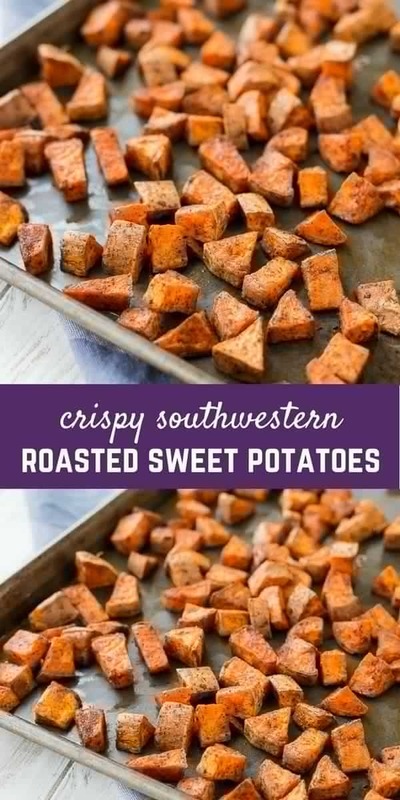 Husband’s take: Sweet potatoes aren’t Ben’s absolute favorite, but I heard no complaints about these! Changes I would make: None are necessary! See the tips in the box above if you want some ideas, though! These are so so good! 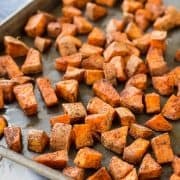 I love making sweet potatoes ahead of time to have with my eggs in the morning as well, but am getting sick of my normal recipe. Can’t wait for the morning!! So glad you enjoyed them! Thanks for taking the time to come back and leave a comment!